Christkindlmarkt. Weihnachtsmarkt. Marché de Noël. Whatever name they go by, Christmas markets are a holiday staple with a long history in Europe. 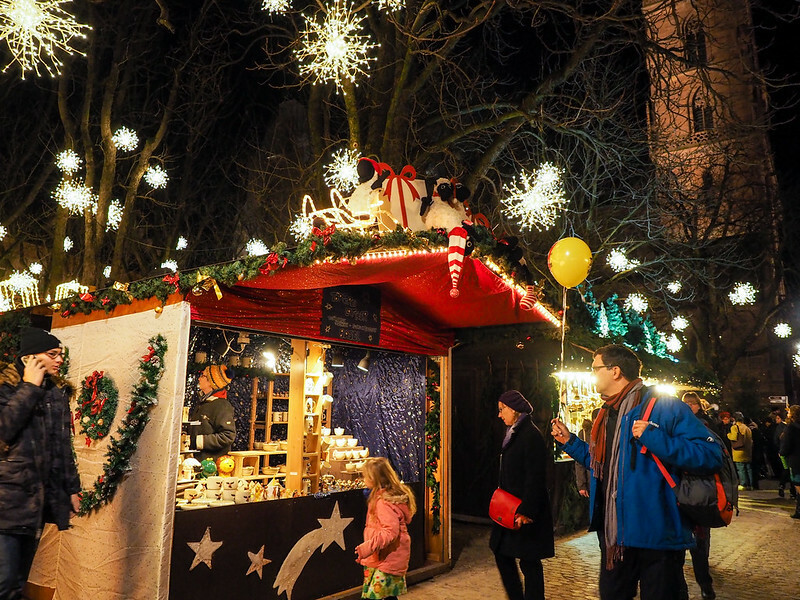 The tradition of the Christmas market can be traced back hundreds of years – all the way back into the Late Middle Ages, in fact. The markets began in German-speaking regions of Europe that today make up Germany, Austria, Northern Italy, and the Alsace region of France. 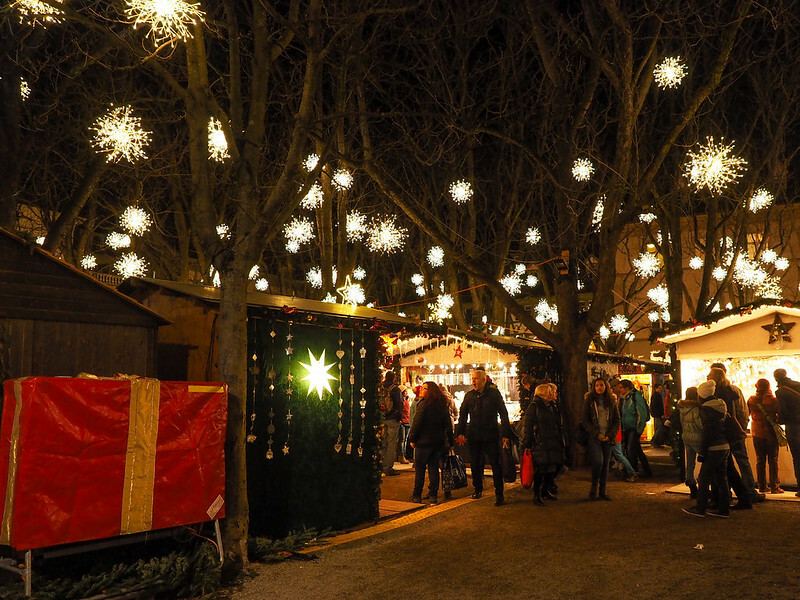 And it's in these regions that you can find the best modern-day Christmas markets, too. 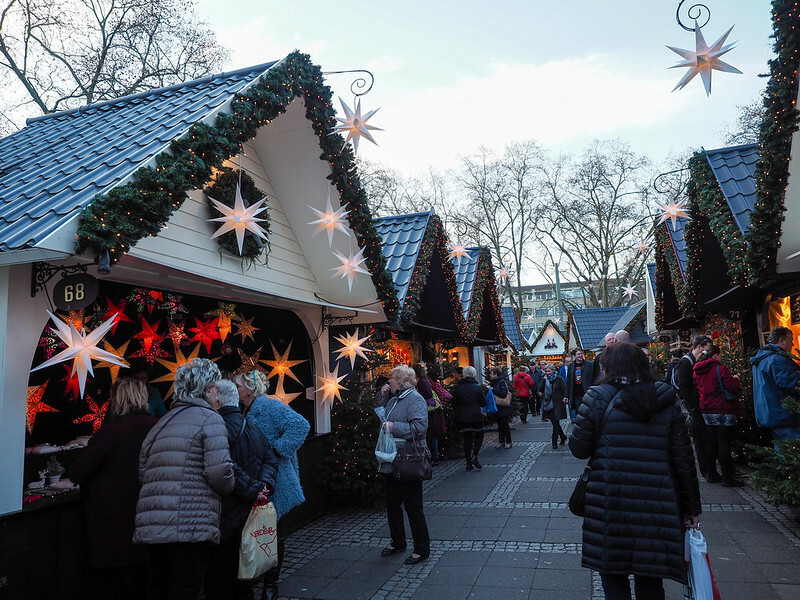 The markets pop up at the beginning of Advent and last the four weeks until Christmas, drawing thousands (sometimes MILLIONS) of visitors each year. Some cities have one main market, while others have handfuls of smaller ones, often with unique themes. 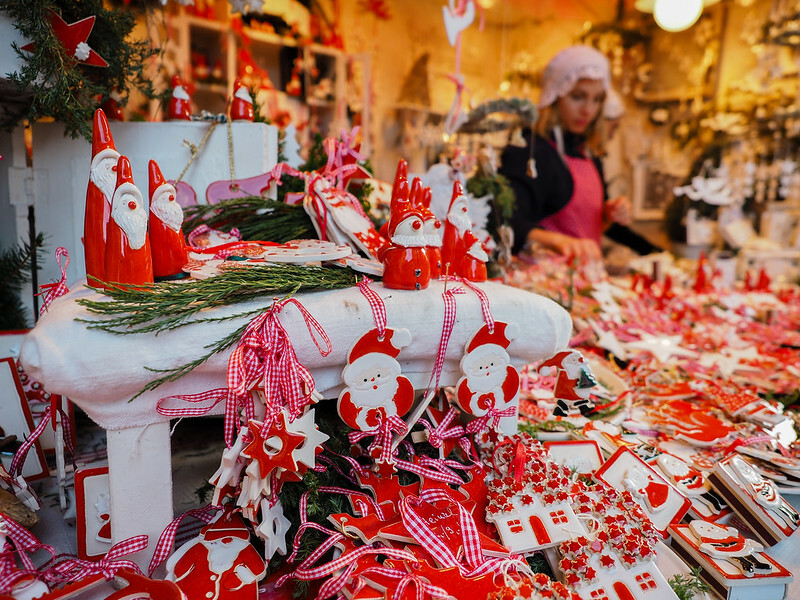 The markets are usually made up of decorated wooden stalls set up in a city square, with vendors selling everything from handmade Christmas ornaments to hot mulled wine and gingerbread. The market stalls are often decorated with twinkle lights and fake snow, making for a wintery, festive atmosphere regardless of the weather. 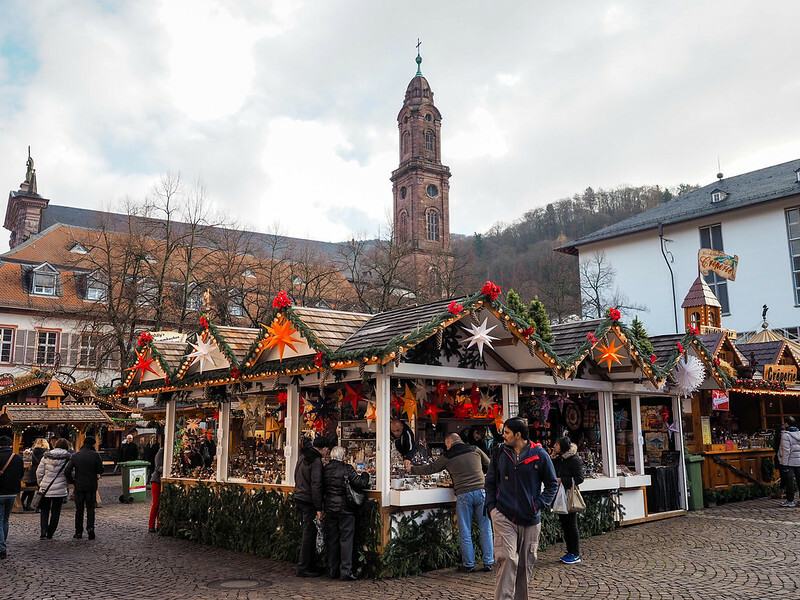 Visiting Europe at Christmastime is something that I've always dreamed of doing, and I finally got the chance this year – I went on a cruise down the Rhine with Viking River Cruises and visited no less than seven cities with Christmas markets throughout Germany, France, and Switzerland. Even though there was no snow in any of the cities I visited this year (darn you, unseasonably warm winter! ), it was still pretty magical. In case you need a little more convincing to add “visiting European Christmas markets” to your own bucket list, here are 23 that will make you want to get yourself to a festive market ASAP! 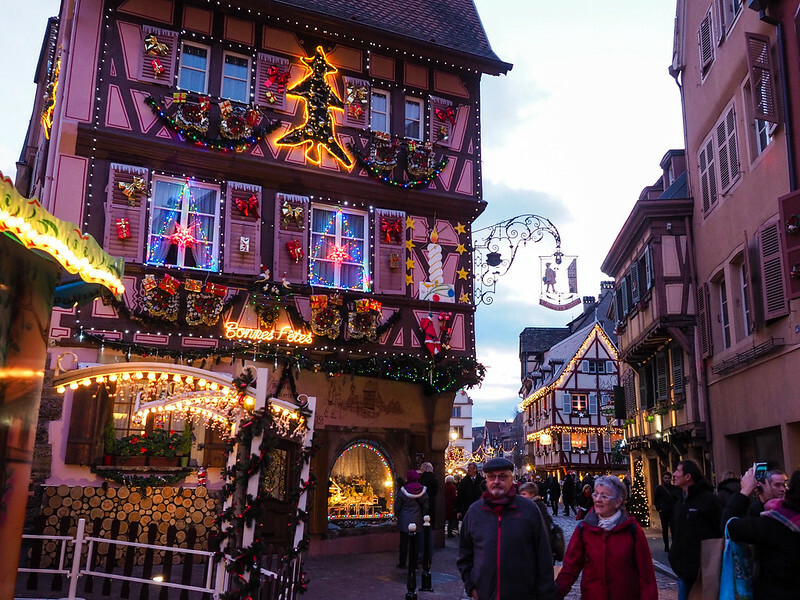 1 – Beautiful decorations in Colmar, France in the Alsace region. 2 – Colorful market in Heidelberg, Germany. 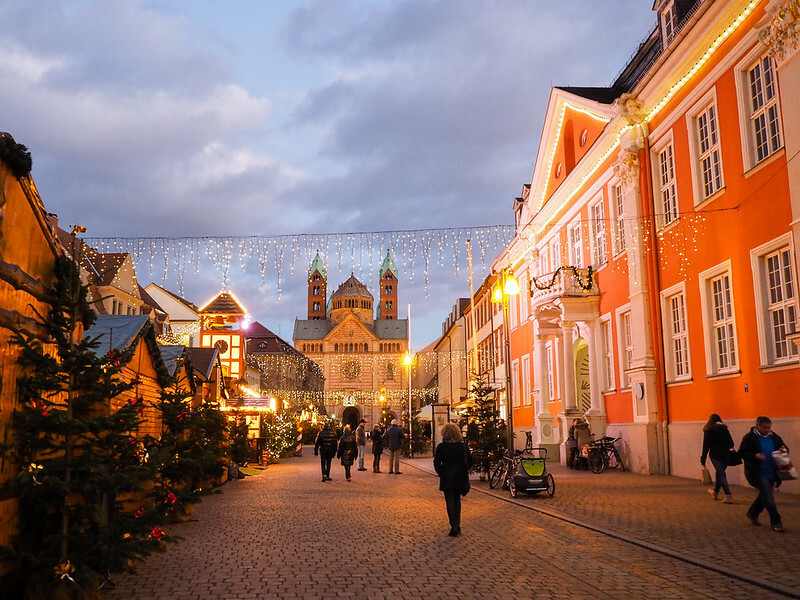 3 – Speyer, Germany, at dusk as all the twinkle lights turn on. 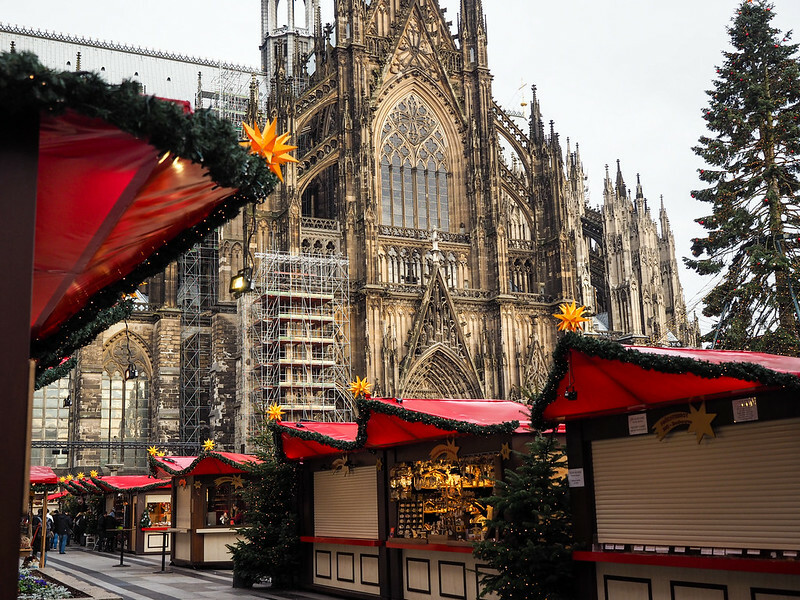 4 – Christmas market at the foot of Cologne Cathedral; one of seven different markets in the city. 5 – Basel Christmas market at Münsterplatz at night. 6 – A Glühwein mug! 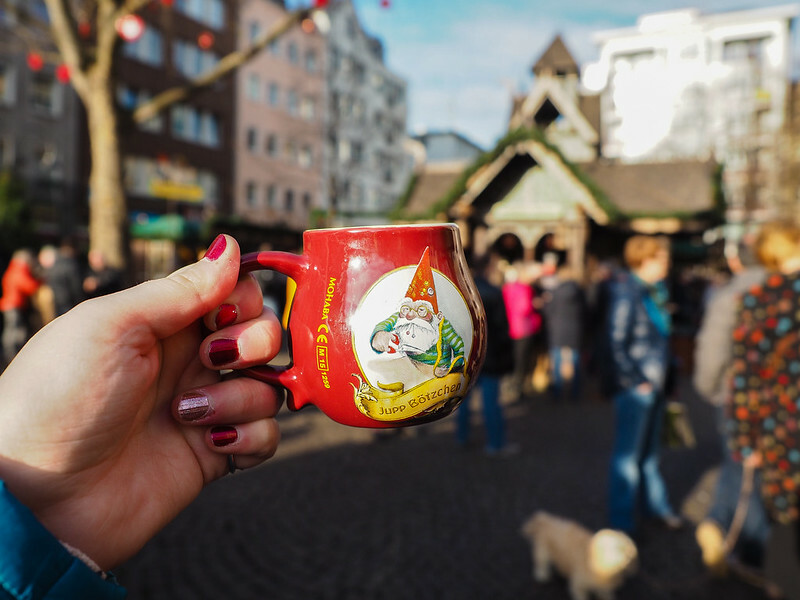 Each market (especially in Germany) has a special market mug each year. You pay a deposit when you buy a mulled wine or hot chocolate, and then can just keep the mug if you want. For just 2 or 3 Euro, these mugs make great (and affordable) souvenirs! 7 – Rudesheim, Germany decked out for the holidays. 8 – Skating rink at the “Heimat der Heinzel” (Home of the Elves) market in Cologne, Germany. 9 – Is that Santa in this stall in Strasbourg?!? 10 – Adorable market stalls at the Rudolfplatz market in Cologne. 11 – Münsterplatz market in Basel, Switzerland. 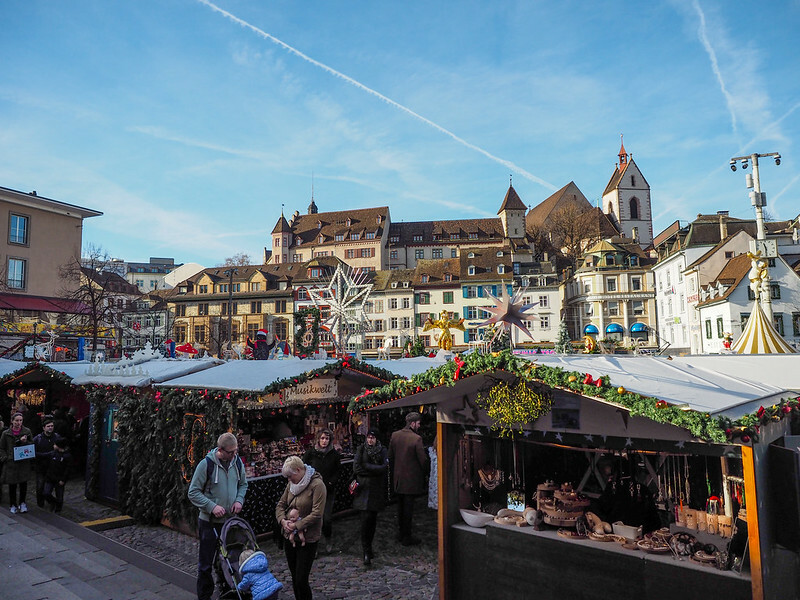 12 – The market at Barfüsserplatz in Basel – the largest Christmas market in Switzerland. 13 – They go all out decorating the stalls in Speyer. 14 – The pretty Angels' Market at Neumarkt in Cologne. 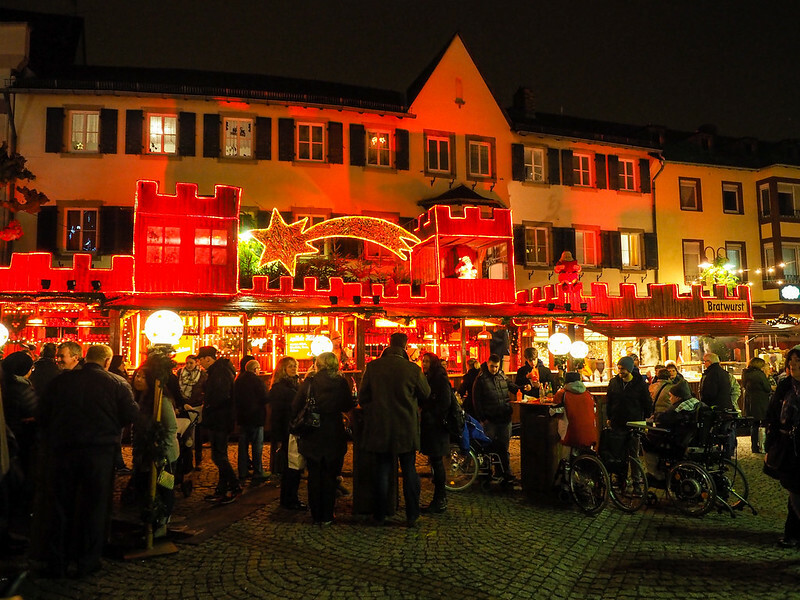 15 – A square lit up and filled with people in Rudesheim, Germany. 16 – Rudolfplatz market in Cologne – one of the smaller (and less crowded) markets in the city. 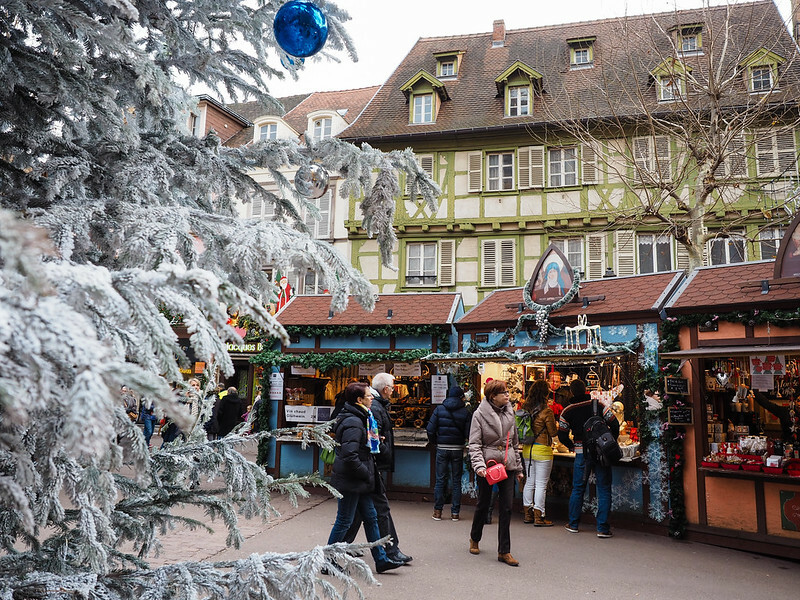 17 – I think Colmar, France, wins for the best Christmas decorations! 18 – A very cute Christmas market stall. 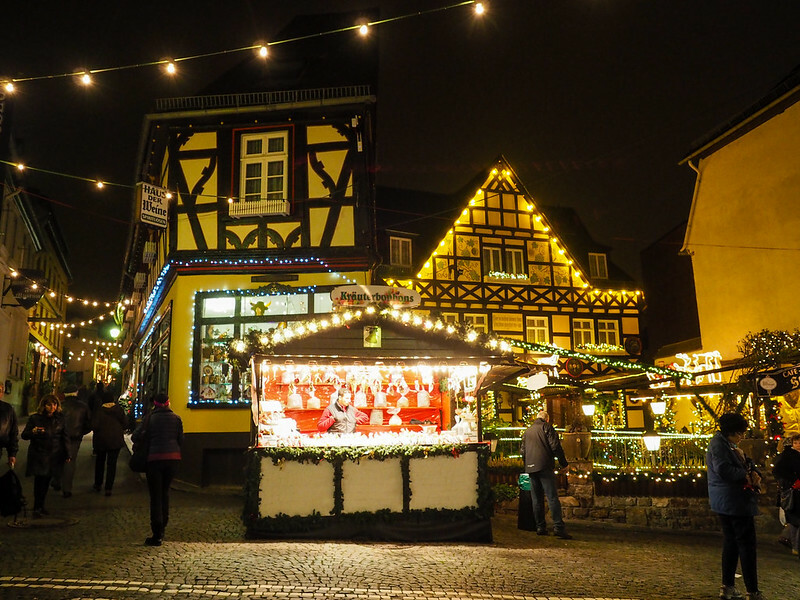 19 – Getting into the Christmas spirit in Rudesheim. 20 – Another market in Heidelberg, Germany. 21 – Christmas market stalls lit up at night. 22 – This is what a Christmas market looks like pre-opening. Most of the markets don't open until about 11 a.m., like this one at Cologne Cathedral. 23 – Christmas ornaments and decorations galore in Strasbourg, France. 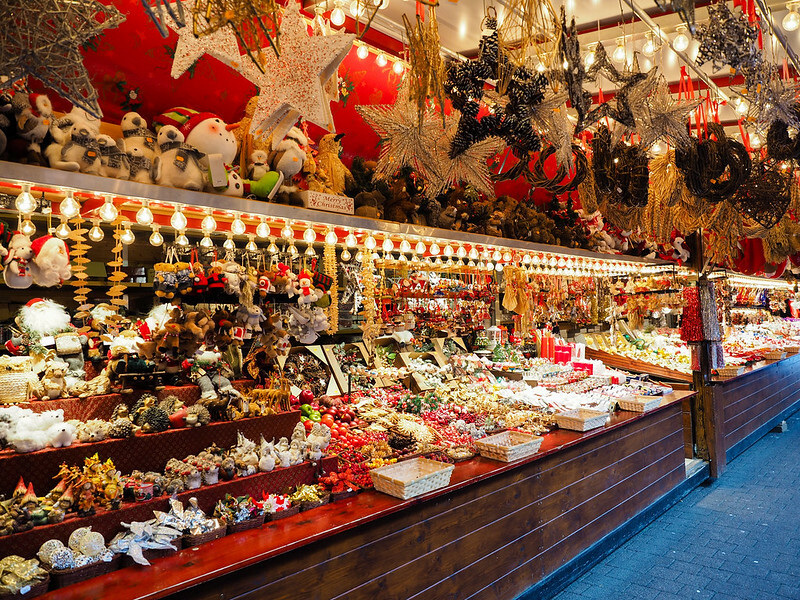 Most cities – large or small – in this part of Europe have a Christmas market (or seven). 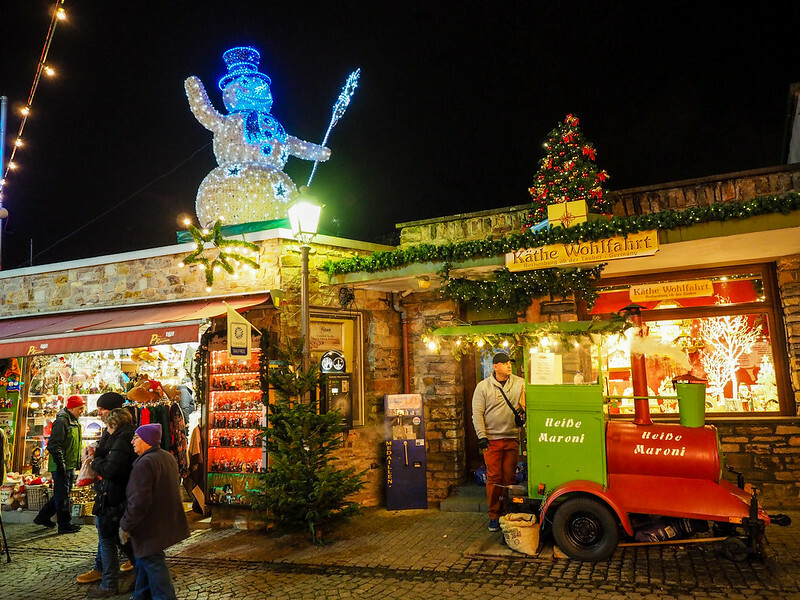 Nuremberg has one of the most famous markets in Germany, and other German cities like Munich, Dresden, Stuttgart, and Berlin are also known for their holiday market offerings. You'll find markets all over Europe, though, from Brussels to Prague to Vienna. Even Spain puts on Christmas markets (though I'm told you won't find much food or mulled wine at those, which kind of defeats the purpose in my opinion!). 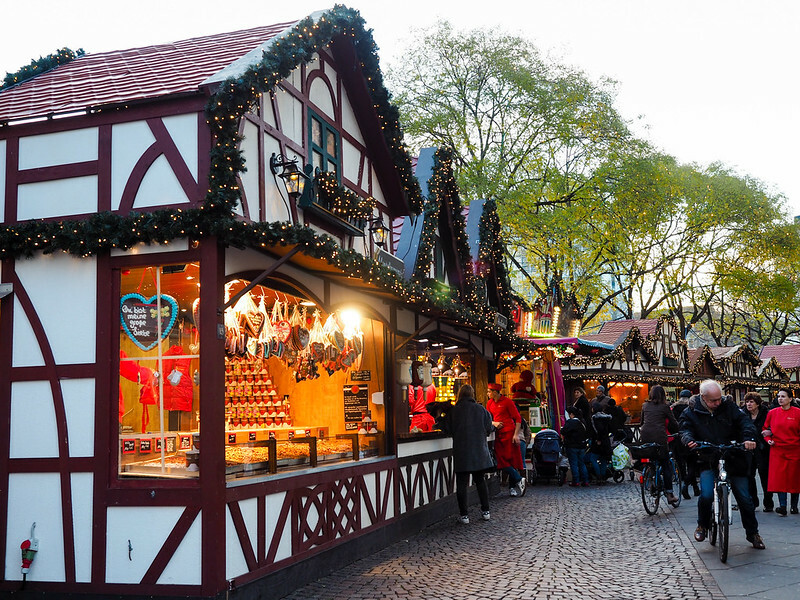 Visiting Christmas markets can be as simple as booking a holiday getaway to a city with a popular market for a few days. Or you could do what I did and book a Christmas market river cruise. 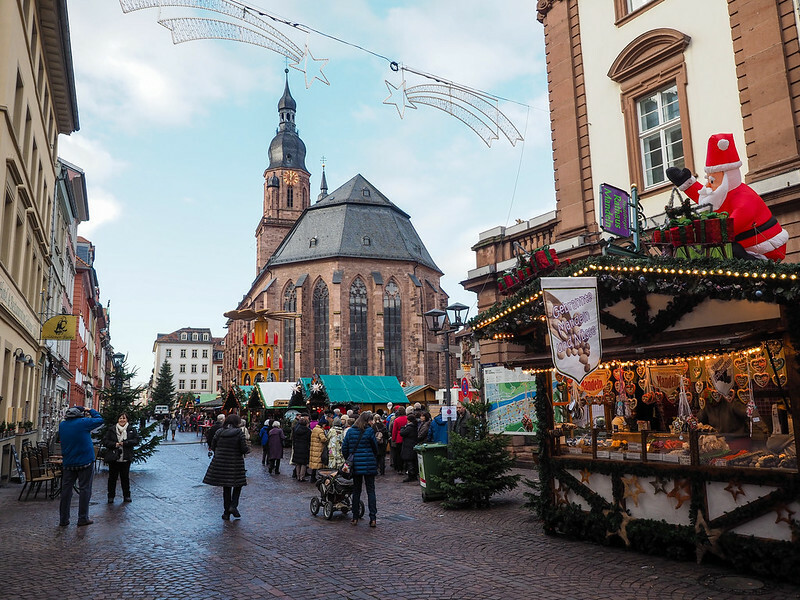 We saw SO many cool cities and Christmas markets on my Rhine Getaway cruise with Viking, and enjoyed holiday-themed activities (and drinks) onboard, too. If a Viking River Cruise can fit into your budget one of these years, I highly recommend going in December! 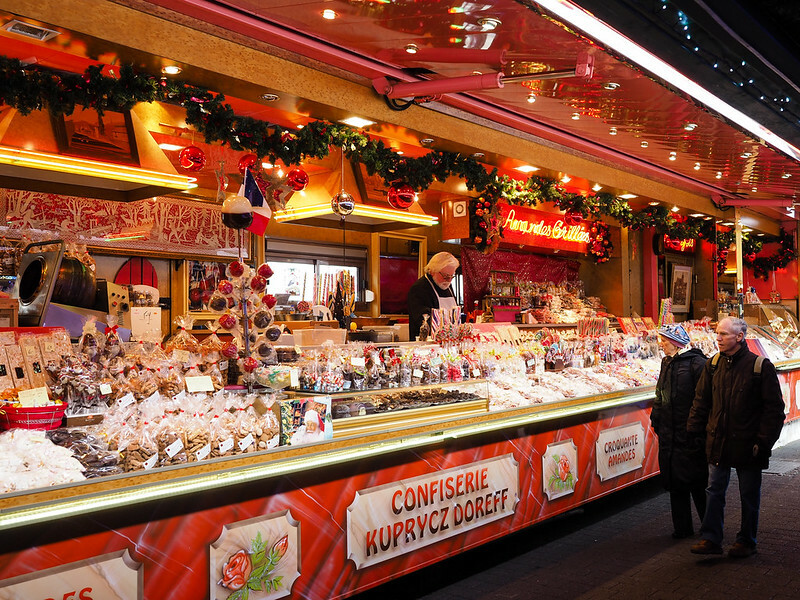 Have you been to any Christmas markets in Europe? If so, which has been your favorite? I haven’t been there, but I HAVE had delicious waffles in Belgium – no doubt there would be some delicious ones at the Christmas markets there! Gorgeous photos! You must have a great camera! Ha ha…just kidding…you are a GREAT photographer; the camera is just a tool. 🙂 My favourite one is the Nuremberg market – I’ve been lucky enough to have gone twice as I have a friend in the area. We did quite a few markets and I must admit I was “marketed” out by the time I left Germany but four years later I’m ready to tackle them again sometime! The Cologne ones look great as well….I visited some of the same places as you did on my Rhine cruise many moons ago but I think a cruise at Christmas time would be awesome. There is just something magical about the markets – especially at night with the lights, the people, decorations and the wonderful smells! I agree…the mugs are great souvenirs. Just about to brew up a cuppa to have in one of them right now – always fun to bring back something that has a lovely memory that you can actually use. Being in Europe and around all the markets around Christmas really was magical. Christmas market season in Germany is my favorite season! I love the lights, the decorations, the Christmas carols, and most of all, the Glühwein! Glad you got to see so many of them on your river cruise! If I lived there, I think it would be my favorite season, too! I’ve heard that Vienna’s markets are really great too! 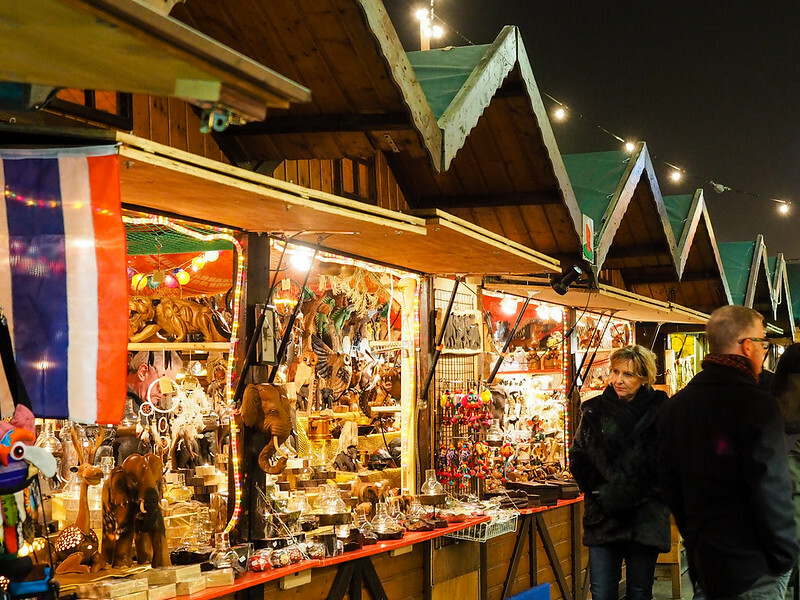 The Christmas Market River Cruise sounds like a great idea! I’ll keep this on my list of potentials for next year! I’ve only visited two Christmas Markets in my life – the one in Edinburgh and this year I’ve been to Dusseldorf. I will also go to Maastricht which is supposed to have the best Christmas Market in The Netherlands. I LOVED doing this as a river cruise. I like river cruising in general, but doing it around the holidays was really special. Thanks, Caroline! It was a really fun trip, and I highly recommend doing something similar one day! Love Christmas in Europe! We have family that lives in Reil, Germany (just south of Koblenz) so we visited them during the holidays about 6 years ago. One of my fave memories. Vancouver set up a similar market a few years ago but its’s just not the same! Yeah, no one does it quite like Germany, if you ask me! Oooh, I didn’t need any more convincing about the Christmas markets, but you have certainly added more beautiful photos to my list of evidence as to why a Christmas markets trip would be a great idea. Thanks Amanda! I just got back from a weekend in Brugge to see the Christmas markets there! They were quite small, with more food then Christmasy items to purchase, but it was adorable! I did find some really special trinkets to purchase and enjoyed much delicious food and mulled wine. Would love to go to the ones in Cologne! I visited Brugge in the summer a couple years ago and thought it must be so beautiful around the holidays! I am heading to Paris and Brussels on Dec 26th and am happy that the Christmas markets will still be open. I so badly wanted to visit them before Christmas, but couldn’t fit it into my schedule. But, a flash sale by British Airways led me to an impulse buy!! A gift to my husband and I – a trip to Paris and Brussels, on our own, no children! Woo! Hoo! Can’t wait! Sounds like a great trip – I hope you love it! Great photos! These are all places I definitely want to visit. My favorites so far have been in Brussels, Budapest and Vienna! I love Budapest – would love to be there around the holidays someday! Awesome photos! Puts the Christmas market at the German brewery here in Charlotte to shame. Haha, yeah, I don’t think any markets in the US can really compare to the “originals” in Germany! We just came back from Germany and visited 7 different markets between France and Germany. My favorite was a small one in the Residenz in Munich, my kids loved the Kids Market in Nuremberg, and my husband’s favorite was Rothenburg ob der Tauber. One thing is for sure, it is definitely something everyone should experience! Agreed! Definitely deserves a spot on every bucket list! Great photos! I would love to do one of those Christmas market river cruises. I thought it was such a great way to (easily) visit a lot of markets! Plus, river cruising in and of itself is really fun and relaxing. I can definitely see myself doing another one! Wow, this will get anyone in the mood for Christmas! Will pin this! Pin away! I’ve been looking through these photos everyday – definitely a great way to get into the holiday mood! 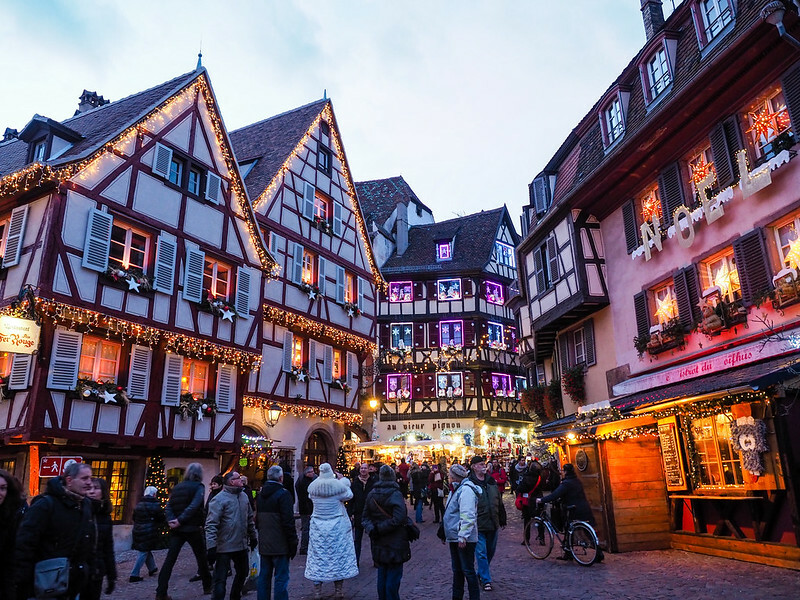 Wow, Colmar looks so colorful and festive! And I love the orderly lanes of the German ice skating rink. Over the past few weeks, I’ve enjoyed holiday decorations in Lisbon, Porto, Barcelona, and Dublin, and am currently exploring the Christmas markets of the Baltic states. So far Riga, Latvia wins for this region! Colmar was so beautiful! Probably one of my favorite stops, just because the whole place oozes Christmas this time of year! Great photos! You’ve really done a beautiful job capturing the energy and atmosphere of Christmas markets in Europe. 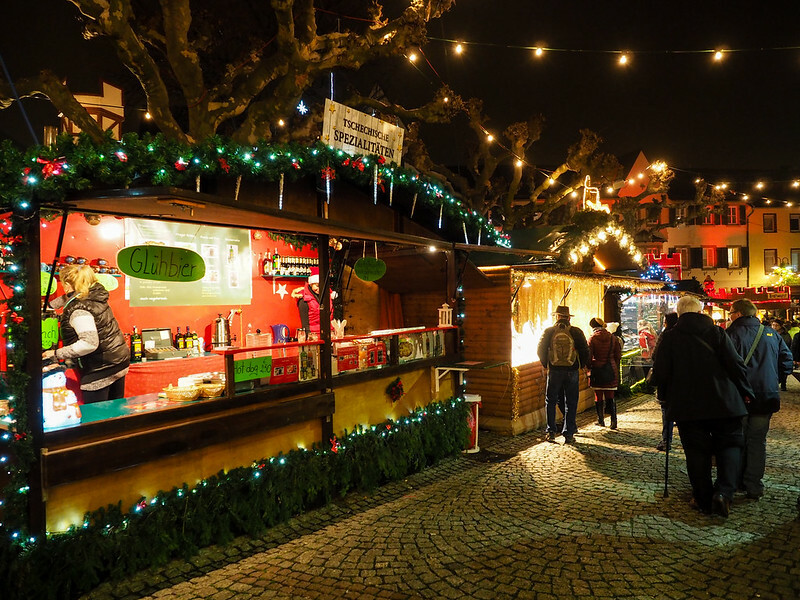 I’ve been living in Germany for the past three years, and one of my absolute favorites is the Medieval Christmas Market in Esslingen am Neckar (near Stuttgart). It’s a bit out of the way, but if you’re ever in the area during the Christmas season, I definitely recommend a visit! Oooo a medieval market? That sounds awesome! Haha yeah, it was lacking snow! But I can’t complain, because it could have been raining! While I loved the markets in Germany, I also have a great fondness for the markets in Italy after Christmas. And seeing everyone converge on Piazza Navona in Rome on the eve of the Epiphany was amazing! I’ll have to keep that in mind! I’ve never been to Italy around the holidays. ‘Love! ‘Love! ‘Love your photographs! And sure, I’ve been to many a Christmas Market as I live in the home of Christmas Markets itself – Germany! p.s. I’ve been to Christmas Markets in various German cities, France and England. I’m now officially jealous of anyone living in Germany because of all those great Christmas markets! These are beautiful and on my bucket list for sure! Christmas is my favorite time of year and I love all the sights, sounds and smells of Christmas. I know Europe is famous for them, but have you been to any markets in the states? No, I can’t say I’ve been to any in the States! I’ve heard Chicago has a pretty big one, but I don’t know of a whole lot of great Christmas markets in the US. These look lovely! I am yet to spend winter in Europe, so I’ve never been able to experience the Christmas markets – I know I would love all the gingerbread and glühwein!! You definitely should do Europe around Christmas sometime! 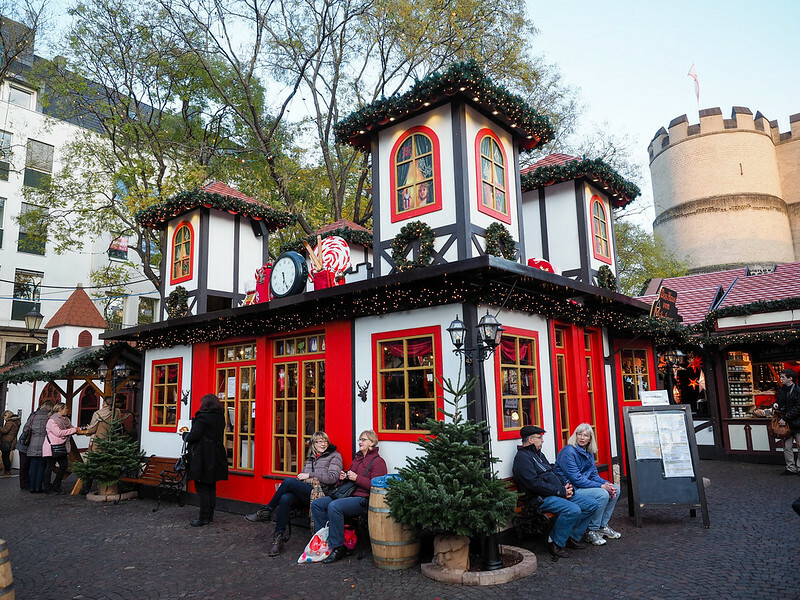 It’s such a different atmosphere – and the gingerbread and gluhwein are great! Do u need to speak German? I visited Bath market this year, and there was not enough mulled wine, or food- tho’ there was a pop up food market in the Southgate centre! There wasn’t ANY baileys hot chocolate either, which made me very sad! 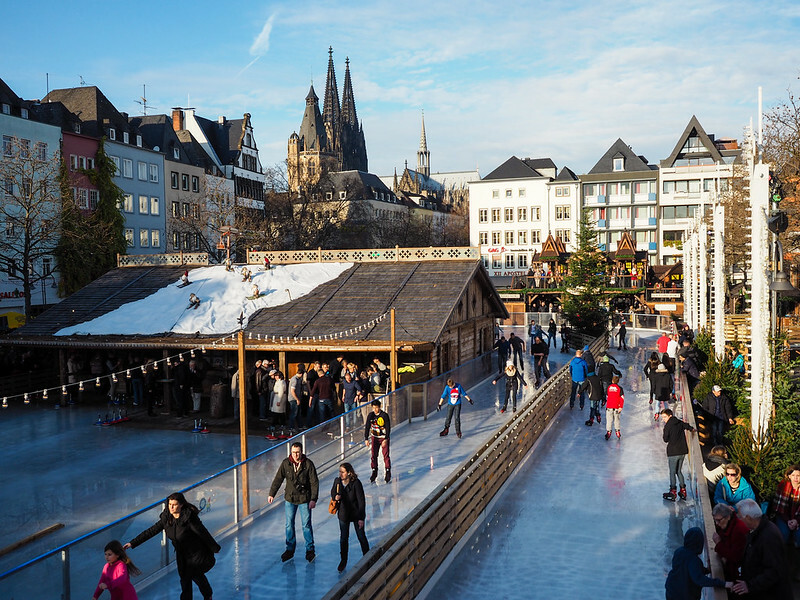 The Koln markets look awesome– especially with the ice skating. 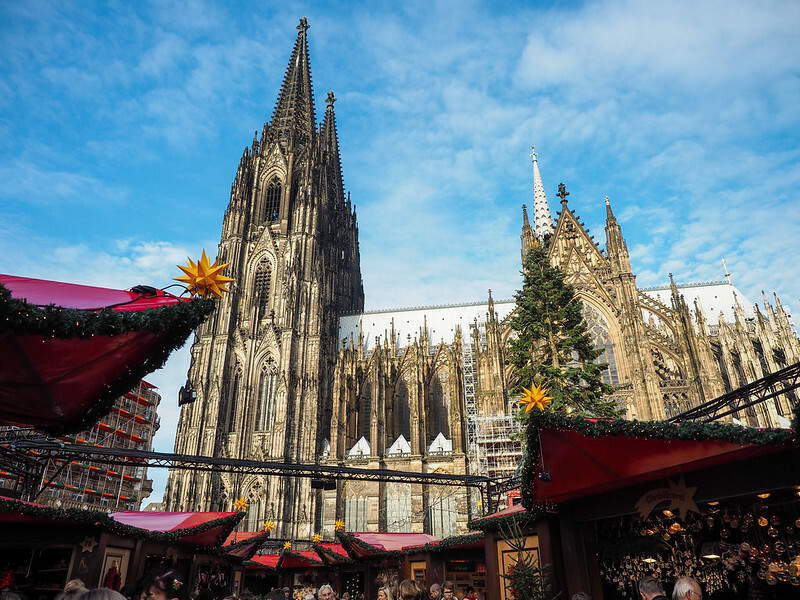 The Cologne markets were definitely the most varied – and perhaps the most festive! Definitely would rank high on my list of best Christmas markets! I haven’t managed to get into Germany, Austria or Switzerland to see any of the christmas markets, but I’ve been in two Christmas markets in Romania – specifically in Timisoara and Sibiu. Small, but lovely, with a lot of local products on display, hot wine with cinnamon and orange and a nice atmosphere. I dream that someday I will manage to get to the Viena Christmas market. But not this year. Maybe the next one. Omg that Prager Schinken at the Christmas Market in Speyer was probably the best thing I ate in all of Germany. Speyer was also one of my favourite Christmas Markets, and the Cathedral was amazing (well worth the two hour detour on the way from Wurzburg to Trier). My other favourite markets was the one in St Wolfgang, Austria (more like a whole christmas town! ), Wurzburg, Germany and the medieval Christmas market in Munich where they set out Gluhwein on fire in goblets! So awesome and unique. I think I’ve got a bit of Christmas Market fatique now- but I don’t think I could ever get sick of drinking Gluhwein! Hey! I definitely recommend you going to the well-known Christmas market in Nuremberg. As I’ve seen you have already put it on your list, so don’t miss it out. 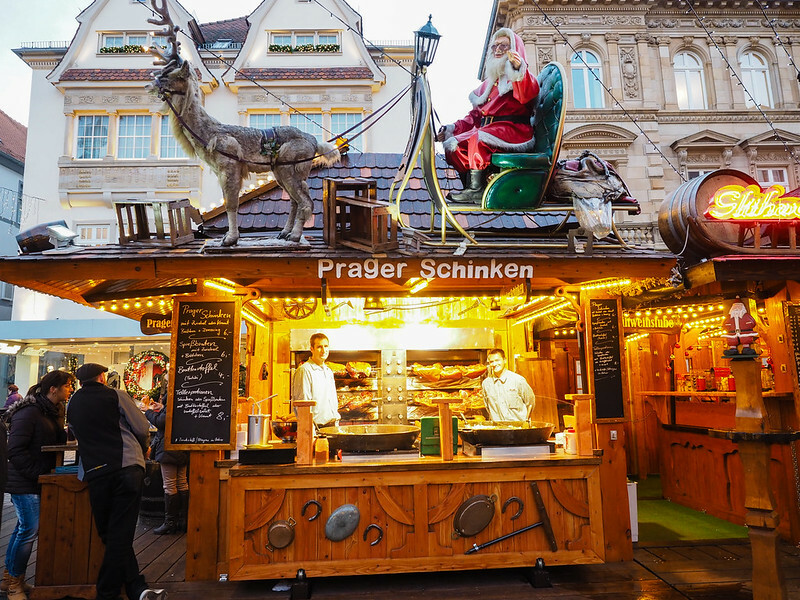 It is very traditional and you can get “Nürnberger Glühwein” and the very tasty ginger bread for which the city is also known for. Furthermore, you should not miss the stands selling “Nuremberg Bratwurst” (grilled sausages). So in case you’re going, you will really have a good time there! I definitely hope to make it there another holiday season! I’m dying to go to Christmas markets in Europe. I would combine it with finding northern lights and Russia. Being from Sydney the flights are long and expensive so I think combining everything and going for aciuple of months would be my best bet. Love the photos. Can’t wait to see for myself. That would be a great trip! Though I would suggest maybe visiting Russia and then heading to Norway to search for the Northern Lights – it’s not as cold in Norway, and they have much less cloud cover in the winter months! Thanks so much for the beautiful photos. We are booked for a Viking Cruise this December and I am even moor excited now that I’ve seen how beautiful it will be. I would love your thoughts on any of the excursions you went on during your trip. We are also planning to visit Lucern for a couple of days before cruise. Thanks again for the pics and any other advice you can give.